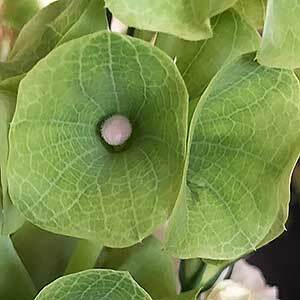 Molucella it is also known as Bells of Ireland and Green Shellflower. Often seen as a florists plant Molucca Balm can be grown in the home garden and you can grow it from seed. This is naturally a tall growing plant with flower spikes to 60 – 80cm tall. The flowers are actually small and white, however they are surrounded by a large calyx, a good clear green, bell shaped and covering the whole flower stem. This is plant from Turkey and nearby areas, so it is ideal for those with a mediterranean type climate. Seeds can be sown directly in spring and germination will be best if they are stratified by being placed in the refrigerator for 7 – 14 days before planting. Best planted in a well drained humus rich soil, sow the seeds in shallow drills and water well with a liquid seaweed fertiliser. Seeds will take around 3 weeks to germinate and will require some warmth, so wait until the weather warms a little after winter. In frost prone areas, wait until the danger of frosts has passed before planting the seeds. The seeds need to be kept moist, however never wet and soggy. From sowing seeds to full flowering will take around 3 months. Seeds are readily available for sale online.